Have you ever heard of hygge? I only stumbled upon this Scandanavian word and concept this year and it perfectly sums out what I always crave in the wintertime. The more I look into this, the more I love it. Unable to be translated easily, the concept seems to cover that feeling of cosiness, togetherness, well being, contentment- the perfect example I found was an idealistic, traditional white Christmas. The loved ones, the soul food, the warmth and contentment. 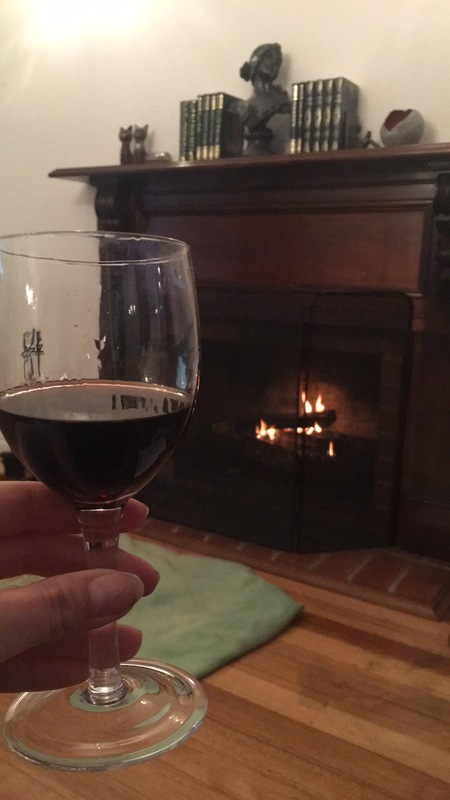 I came across the concept in an article of easy easy to incorporate hygge into your life- lots of warm, comforting soups, quality time with friends and family, acknowledging those small treasure moments of a good book, cozy blanket and roaring fire. Sounds simpler in theory than practice in this crazy busy modern life but I suppose the key comes down to recongnizing and creating those little simplicities in life that are pure nourishment for the soul. These last few weekends I’ve been able to step back and really open my mind to all those beautiful hygge moments that just appear in life naturally- driving up to my childhood home in the hills, seeing all the beautiful fading autumn colours and the smell of wood fires. Or spending a good few quiet hours on Sunday morning in my pj’s (something I never do), soaking in the rate winter sunshine with the cats. Man, it’s so easy to feel beyond grateful that these are moments I can happily relax away in. And of course- the baking. The beautiful warming pies, poached fruits, banana breads, all the carbs that I plan to hide the consequences of until summer! 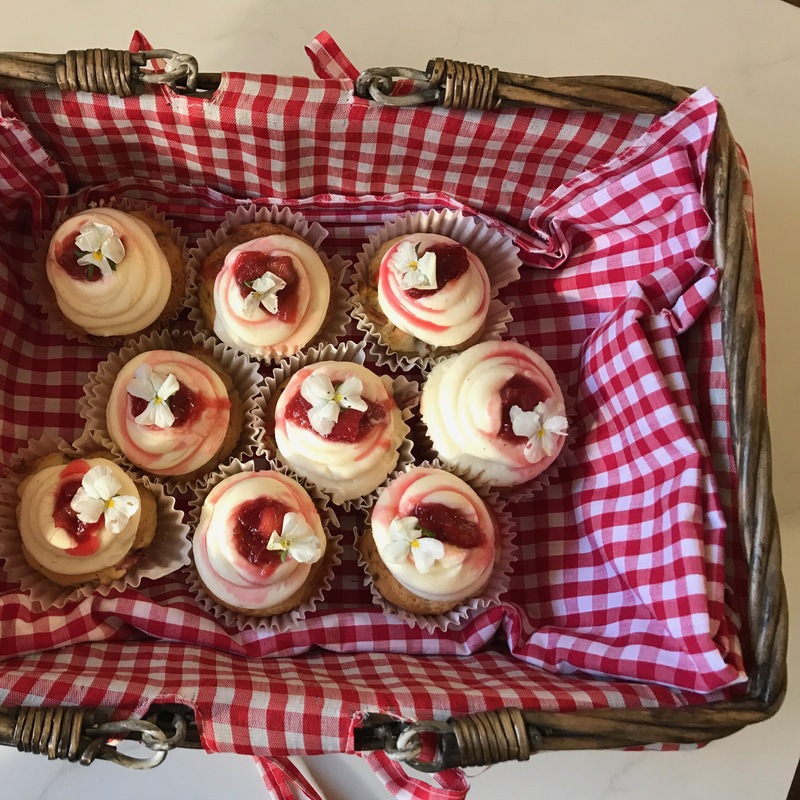 After stealing some rhubarb from the parents garden, I baked up these cosy little cupcakes to take along to a girlfriend’s house. She’s a ginger fiend and when I make these next I’ll make sure I boost the ginger even more than I did this time- all though it gives a delightful little kick to the icing, it’s wasn’t strong enough for us full-bore ginger lovers (so I pimped with crystalized giner- NOW we are talking!) The original recipe is from CallmeCupcake (find it here! ), and man, if you haven’t checked this blog out before- GET. ON.IT. Those photos are to die for! 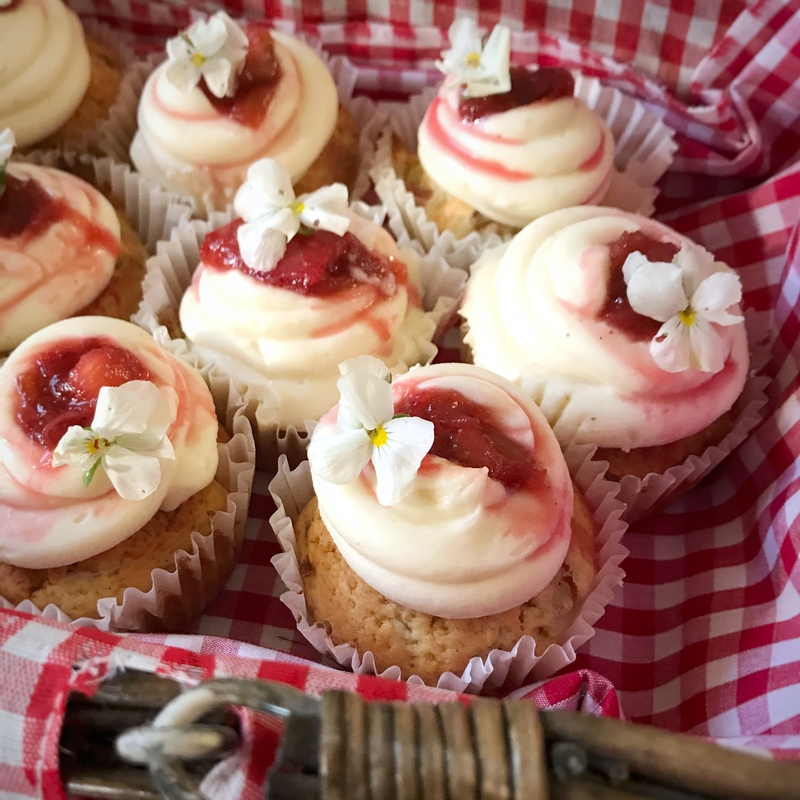 These cupcakes are a dense style, so if you are after a fluffy little number they are not for you- but studded with rhubarb pieces and tingly little nuggets of ginger, they are hygge to the core. Preheat oven to 175°C. Prep your pan with cupcake liners in your chosen size. 2. Mix flour, sugar, baking powder, ground ginger and salt in a large bowl. Add butter, eggs, sour cream and vanilla and beat until smooth. Stir in chopped rhubarb and ginger. Divide batter amongst the cupcake liners and bake for 20-23 minutes for normal size cupcakes. Leave to cool before icing. Put rhubarb, water, sugar and vanilla in a saucepan. Let simmer very gently for about 3-5 minutes. The original calls for caution and they are not joking- do not wander away from this or you will have stewed rhubarb. Put a strainer on top of a bowl. Pour mixture into strainer and put the rhubarb pieces in another bowl to cool. Pour the liquid back into the saucepan and let simmer until slightly thickened, about 5-10 minutes. Pour into a bowl to let cool. Mix together rhubarb and liquid. Beat butter until pale. Add icing sugar and beat until smooth and pale, about 1 minute. Add cream cheese and ginger, beat until smooth and creamy. Pipe a generous swirl onto the cooled cupcake. Use a small spoon to create a little well in the centre of the icing. 4. Spoon a dollop on poached rhubarb into the well. This is a gorgeous tart flavour so I definitely recommend being over-zealous with the dollop. Happy baking and happy hygge hunting, beautiful people! Last weekend was all about endurance for me. Myself and three other brave women took on the Oxfam Trail Walker- 100km in 36 hours; walking from Friday morning all the way through to Saturday evening, even braving a 7 degree Friday night in the depth of the hills. It was exhausting, agonizing, limit- testing, amazing, fun, powerful; so many things. But it was certainly not relaxing. 92km’s in and had been walking for 32 hours. Still smiling though! So this week is all about comfort for me. Catching up with girlfriends, spending some time at home….and food for the soul. At the peak of our freezing cold night of hiking all I was thinking of was warm, freshly baked goods…(well, and my bed; good god, how I wanted my bed)…and nothing is more comforting than freshly baked breads. Scrolls to be exact; Hot, sticky, risen in the sun scrolls. These are perfect to be shared and the easiest recipe to tweak to any particular cravings. This week I’m thinking cinnamon, dark choc, sultana and golden syrup. Rich and warm. Make The Dough: In a small saucepan, warm the milk over low heat until lukewarm. Pour the warm milk into the bowl of a stand electric mixer (ideally with a dough hook, but I’m not that fancy; standard works just fine). With a spoon, manually stir in the sugar and yeast. Cover with a towel and let sit until the yeast is foamy, about 5-10 minutes. On low speed, beat in the softened butter until it is slightly broken up. Next add the eggs, one at a time, and then the salt.On low speed, gradually add the flour. Once it is all added, beat on medium speed until a soft dough forms. Increase speed to medium-high and beat until the dough is soft and supple, about 8-10 minutes longer. Transfer the dough to a lightly floured surface and knead it with your hands for about 2 minutes. Form the dough into a ball and transfer it to a lightly greased bowl. Cover the dough and let sit in a warm place until doubled in size, 1 to 2 hours. Butter/grease/spray with non-stick spray the bottom of a 9×13 inch baking dish, then line with parchment paper. Turn the dough out onto a lightly floured work surface and, using a rolling pin, roll into a 12×18 inch rectangle. Personally, I’m not so great at the accuracy for this; if you are pedantic you can use a ruler and scribe but I’m more of an eye-ball kind of girl. Combine your softened butter and cinnamon and spread thickly over the entire dough rectangle. Make sure you take it all the way to the edges! Starting from the furthest edge from you, roll up the edges to create an 18 inch log. Slice this into 12 equal slices and lay out across your baking tray. Cover the rolls and place back into your warm area for another 2 hours to rise. After the rolls have risen, preheat the oven to 180 degrees. If you are feeling a little generous, drizzle over a little more golden syrup. Cover the rolls with aluminum foil and bake for about 25 minutes, until they are golden and the golden syrup is bubbling. Transfer the pan to a rack to cool for about 15 minutes. Drizzle with additional golden syrup if you want a super sticky top; brush the top with a glaze of 2 tablespoons icing sugar and 4 tablespoons of boiling water.